You may subscribe to the magazine either in the print form or in the digital form (PDF or EPUB file). 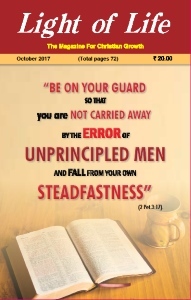 The annual rate for the print and the PDF versions is Rs. 200 and for the EPUV version Rs. 250. You can send the amount by electronic bank transfer to the Light of Life savings bank account No. 003601021256 (IFSC code ICIC0000036) in the Maratha Mandir Branch of ICICI Bank followed by intimating the details (your address, email address and choice of subscription - print or digital) by email to ' lightoflife2777@gmail.com '. The susbscription may also be sent by regular money transfers. However it is important to send your email address for subscription to the digital version. Details and samples may be seen here for the digital version. Write to us from this web site for a free sample of the print version. Editorial: Making of books - We need to be discerning when many Christian books are coming out nowadays, says Jacob Ninan. Beauty in one’s feet - Those who strive to bring blessings to others by carrying the ‘good news’ have the most beautiful feet in the world, states T. A. Prabhu Kiran. Four reasons why you must have faithfulness - To be faithful is not an event, rather, it is one’s life journey, asserts Worring Kashung. Who is the greatest in the kingdom of God? - Child-like simplicity can make people perfect human beings as well as the true servants of God, challenges Arny Roberts. The mountain too high to climb - Imanuel Christian asserts that Christianity is not a religion, but a relationship with God through Jesus Christ. Forbidden fruit - Christiana Joseph encourages us to consecrate our lives anew to God. Meagre faith meets mighty faith! - God honours His faithful, even when they have faith of the size of a mustard seed, contendsJ. N. Manokaran. Beyond the grave - There is the judgment of God and life in eternity that excels death, states M. G. Mathews. Lessons of Palm Sunday - Suresh Manoharan teaches on the significance of Palm Sunday. The art of being alone - Let us live by trusting Him, stresses Samip Baruah. The making of Peter, the disciple - 6 - The more dangerous temptations are when we use God’s word, or some truth about God, to justify our own self-interests, emphasises Sandeep Poonen.